The fifth deadliest heatwave in the global record continues to claim lives in India. As of earlier today 2300 souls were accounted lost due to oppressive May and early June heat preceding a delayed onset of a substantially weakened annual summer Monsoon. Temperatures across India have ranged from the middle 90s to as high as 114 degrees (Fahrenheit) over recent days with readings remaining in heatwave ranges even throughout the night. 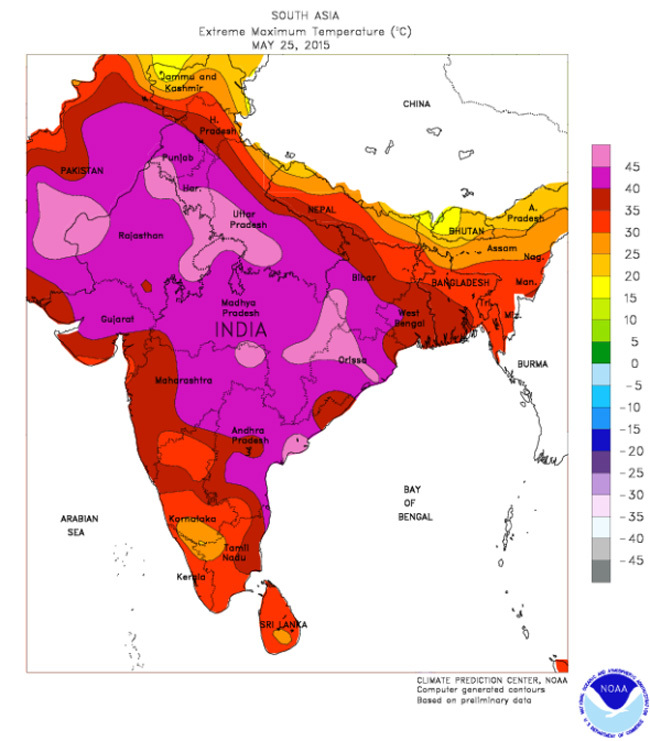 The above May 25 temperature map by NOAA displays an extreme heat pattern that has remained in place now for weeks over India, with 40 degree Celsius (104 degrees Fahrenheit) temperatures covering a greater portion of the country. Andhra Pradesh, at the center of this hot zone, has seen the most impact with more than 1700 souls lost there as of this morning. As with most heatwaves, the elderly, the poor, and those who work outdoors have shown the highest losses. In this heatwave, field workers, who survive on daily wages, have been particularly hard-hit. The choice for them has been a brutal one of brave the blazing heat and risk life or stay home in the shade and risk livelihood. A smattering of rain showers has started to infiltrate sections of India as of today, bringing isolated relief. 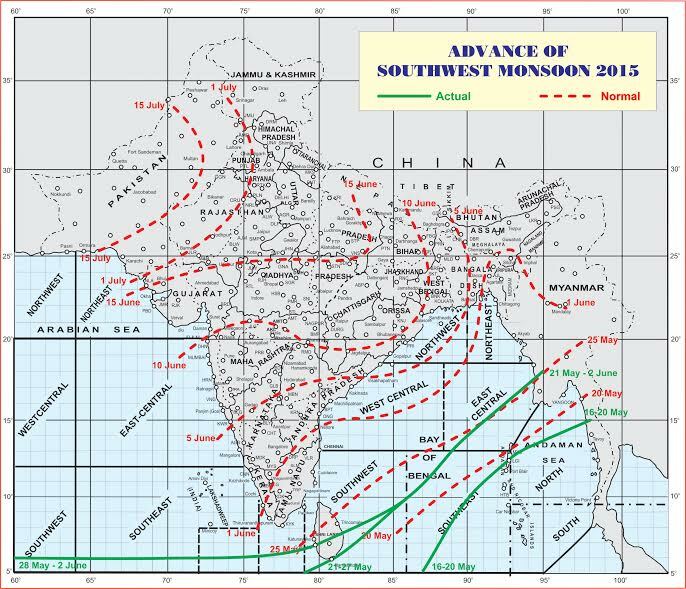 But, overall, the larger Indian Monsoon continues to hold off, delayed at its gates in the Bay of Bengal. As of June 2, Monsoonal advance had only proceeded to the typical May 25 line — more than a one week delay. A cruel tardiness for poor, sweltering India. Adding insult to an already bad climate state for India, as of this morning the Government had also downgraded the expected strength of the monsoon to 88 percent of a typical year. The 12 percent loss of water from the farm-feeding rains would increase risk of an agriculture-disrupting drought in many of India’s states. Such a drought could hit the 50% of India’s non-irrigated farms quite hard while also adding stress to water supplies feeding the irrigated facilities. Human-forced warming of the oceans through fossil fuel burning has almost certainly had an impact on this year’s drought and monsoon delay for India. The warming has added about 0.6 C of heat to a now strengthening El Nino over the Equatorial Pacific. In the past, only strong El Ninos provided enough atmospheric heat forcing to delay monsoons, spark powerful heatwaves, and spur droughts across India. Now, even weak to moderate events are having this effect with last year seeing a mere shift toward El Nino conditions delaying monsoonal progress and reducing rainfalls across the region. In addition, recent studies have found that 75 percent of heatwaves are now caused by climate change globally. So, as with the Texas floods of the past few weeks, when we are looking at instances of freakishly extreme weather, we are also looking at the growing impact of human-caused climate change. Unfortunately, due to the delayed monsoon and extreme heat deeply entrenched throughout many regions of India, we can expect a high risk for loss of life to continue for at least the next few days as a weakened and delayed monsoon fights to gain ground. This is an instance of yet another early, easy outlier of the very extreme climate change related weather that will follow, with locked-in conditions worsening so long as we continue burning fossil fuels.